The 2018 holiday online shopping season got off to a record start for SmartEtailing clients. Online sales for bike shops were up a combined 41% over 2017 for Black Friday and Cyber Monday. According to recent data from Google, "Only about 18% of shoppers consolidate all of their shopping to the Black Friday-to-Cyber Monday period." This suggests that the strong start to the season could lead to record December online sales. Whether consumers are buying online or visiting the store, Google reinforced the role a retailer's website plays in shopping confirming that people are spending up to 63% of their time online during the shopping process. Nearly half of all orders on Black Friday and Cyber Monday were for in-store pickup. This is the most attractive type of online order for most bike shop owners because the online transactions bring customers into the physical store. This increase likely led to additional holiday sales for bike shops because, "62% of customers purchase additional items at the time of in-store pickup," according to ecommerce solutions provider Order Dynamics. Black Friday online sales across the SmartEtailing network were up 90% over 2017. There were 55% more orders with average order value increasing by 22%. Cyber Monday results were also up, but to a lesser extent. Sales were up 18% and orders were up 31%. The average order value on Cyber Monday was down 10% from 2017 which reinforces the discount nature of Cyber Monday. As a way to benchmark site traffic volume it is helpful to compare Black Friday and Cyber Monday results to June 19, the highest volume day of 2018 for the SmartEtailing network. Site visits were approximately 50% lower on Black Friday and Cyber Monday compared to the June benchmark. This is predictable considering the off-season timing of holiday shopping for the cycling market. While site visits were lower during the holiday period, shoppers were visiting bike shop websites with much more intent to buy than summer visitors. 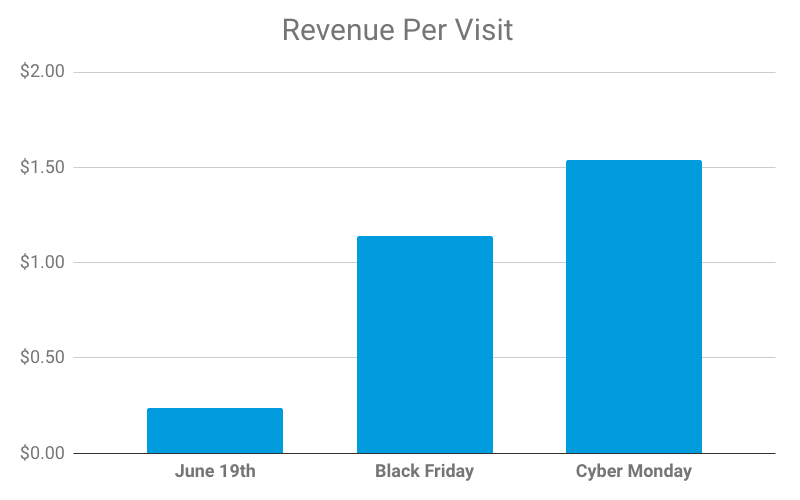 Revenue per visit was 376% higher for Black Friday and 543% higher for Cyber Monday. Conversion rates on Cyber Monday were 550% better than the June benchmark which could also be a result of improvements made to product detail page design during 2018. We continued to see increases in website visitors on mobile devices, with 59% of visitors over Black Friday weekend visiting bike shop websites from a mobile device. According to the National Retail Federation, "66 percent of smartphone owners used their mobile devices to make holiday decisions, up from 63 percent last year." If you have a SmartEtailing website then make sure you are prepared to capitalize on this growth. 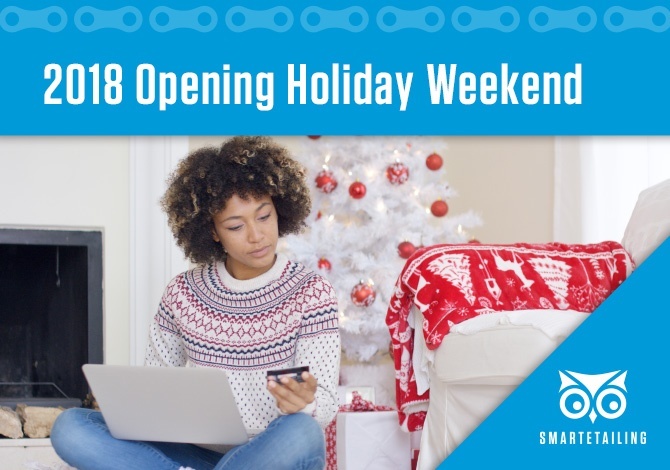 If you need any assistance with your holiday website setup or merchandising please contact your SmartEtailing support or marketing representative.